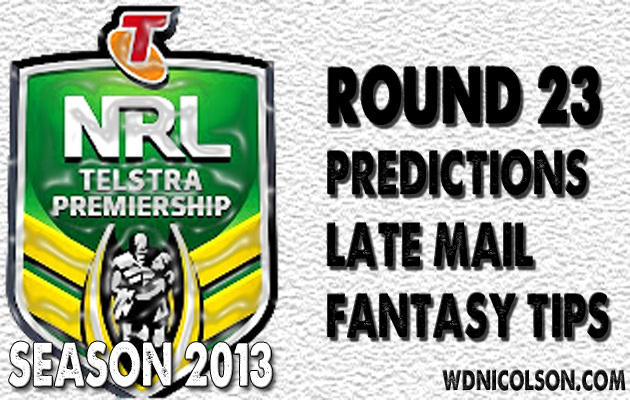 For our analysis of Tuesday team selections for Round 23 - click here. 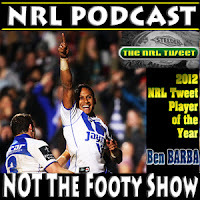 The Postman has to take a week off his NRL Dream Team and NRL Super Coach tips... I know the timing isn't great but he's been hit for 6 by the flue after a business trip to Dubbo. You're lucky you are getting Tips and Late Mail! Voting Allocation for Round 23 of the NRL is below. Sea Eagles by 7 points. LATEST OF LATE MAIL: Inglis will play for Souths but Sutton is still not 100% confirmed - check the lineup an hour before the game. There's also a chance Walker might return and he could even come off the bench if Sutton misses out and Keary starts. Lima should also return. Manly might make Tom Symonds a late inclusion with the lack of Watmough, with Gower or Hasson missing out. STOP PRESS: Watmough is playing for Hasson. Sutton is also playing, while King drops out for Walker in the centres and Clark comes in for Lowe. Just pick Brisbane and move on. By all means give Parra a chance if you want but Brisbane can't afford to lose and it was only the inclusion of Hayne that reminded Parra how to win.., against the Tigers. LATEST OF LATE MAIL: Brisbane have steadfastly claimed there will be 'no late changes' so Kahu plays for Drew and Stagg or Gillett will lineup in the centres. If they are truly 1-17 it means Anderson and J Wallace miss out. Parramatta may tweak things before kick-off but the squad is unlikely to have any new arrivals from the 19 named on Tuesday. STOP PRESS: J Wallace comes in for Anderson/Slyney as final bench player. LATEST OF LATE MAIL: Learoyd-Lahrs was keen to play but like Campese, is out for the Raiders. Lahrs has strained his hamstring and will miss, while Williams (if his ankle is fine he'll play) will come in for Campese. Lee may also be a late inclusion to take advantage of Perrett's inability to catch a kick targeted at his wing or the forgotten Robinson might get recalled. Canterbury may shuffle things at kick-off again but it looks like the Morris at FB experiment continues for at least another week. Going the 'upset' based on realistic Top 8 calculations... Titans win they could move as high as 6th... Cowboys win they could move as high as 10th. To clarify: the Titans are 8th, the Cowboys are 12th. Pick the team in the Top 8. Zillman/Srama back helps. LATEST OF LATE MAIL: Doubt we'll see any changes for the Cowboys, while the Titans should get Zillman back for Dowling and check the flight records to see if there's another sneaky inclusion... ie Srama and one more. Personally never find these games interesting... which is strange because Cronulla/Red V fans love it. I think it is stylistically neither play a game I like to watch. Gotta stick with the Sharks - even if Merrin and Dugan weren't hurt for the Dragons. LATEST OF LATE MAIL: With Nathan Fien announcing his retirement from the Dragons this week - will Josh Drinkwater get a crack at starting this week as Fien goes to the bench? Ryan and Tupou should return for the Sharks after being close last week, while Ross or Tagataese will miss out on the final bench spot. Graham wasn't listed but may yet play, while Fifita's status needs to be checked an hour before kick-off. LATEST OF LATE MAIL: Ropati is being talked up again as a key cog in the Warriors' finals run - so is this finally the week he comes in for Laumape and Hurrell goes to the wing? Packer may also be a late inclusion. Penrith may shuffle their lineup come kickoff with Coote and not John starting at five-eighth, while Segeyaro is likely to play off the bench this week. Newcastle might put up a fight... they may even win. But you need to stick with the Storm - despite a win by the Knights being so key to their standing in the Top 8 improving. Can't pick Newcastle with the Big 3 playing. LATEST OF LATE MAIL: McKinnon looks set to play for the Knights after getting through his NSW Cup warmup last week. Gower will probably miss out again. The Storm may bring Blair back in the centres but they play the Eels in Melbourne next Sunday - so they may not rush him back just yet. Griffin or Kenny Bromwich get the final bench spot. Don't pick the Tigers. Pick the Roosters. Analysis over. LATEST OF LATE MAIL: Farah has til Monday to prove his fitness for the Tigers... and do you really think he's going to tell Twitter if he's playing or not after 3000 niff nuffs message him? Iosefa has been named so he could play even if Farah does as cover with Luani missing out. Nofoaluma hurt his ankle in the 2nd half last week and may just be right due to the wait between games. Tuqiri returns, while Sue is in doubt with a dizzy head. The Roosters may yet include Minichiello if he's confident in his knee after a couple of weeks off. What are your tips for Round 23?